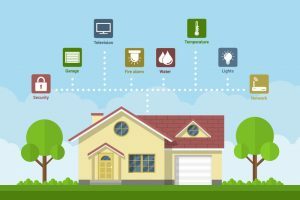 Why Should I Make My Home a Smart Home? Nowadays, we are surrounded by “smart” technology. It’s rare to find someone without a smartphone; our televisions have their own app stores; there’s even a smart kettle, which is admittedly much more trouble than it’s worth. But the bottom line on all the smart stuff is this: you only need it if it makes sense for your needs. Of all the smart applications out there, we think making your home a smart home with home automation services is something that most people can get on board with. It may sound excessive at first, but after you understand some of the benefits, you might start wishing you had one. Posted in Home Improvement | Comments Off on Why Should I Make My Home a Smart Home? Energy efficiency is often considered a concern for places with cold winters, which definitely does not apply to the Inland Empire. This winter has been much warmer than normal – temperatures in the past few weeks have been actively warm – which may lead homeowners to conclude they don’t need an energy efficient home. But the same factors that keep homes back east warm in the winter can help keep them cool in the summer, which is of great concern to those of us here in Southern California. Soon enough, another blazing summer will be upon us, which means that now is the time to consider improving your home’s energy efficiency. There are some specific steps you can take, and with the help of a trained expert, it could translate into big savings on your monthly energy bills. We’ve listed a few of them below.